Secretary of State Mike Pompeo told CBN News on Thursday that it's "possible" President Trump was sent by God to be a savior of the Jewish people. "Could it be that President Trump right now has been sort of raised for such a time as this, just like Queen Esther, to help save the Jewish people from the Iranian menace?" Mitchell asked Pompeo. "It was remarkable � so we were down in the tunnels where we could see 3,000 years ago, and 2,000 years ago � if I have the history just right � to see the remarkable history of the faith in this place and the work that our administration's done to make sure that this democracy in the Middle East, that this Jewish state remains," he said. 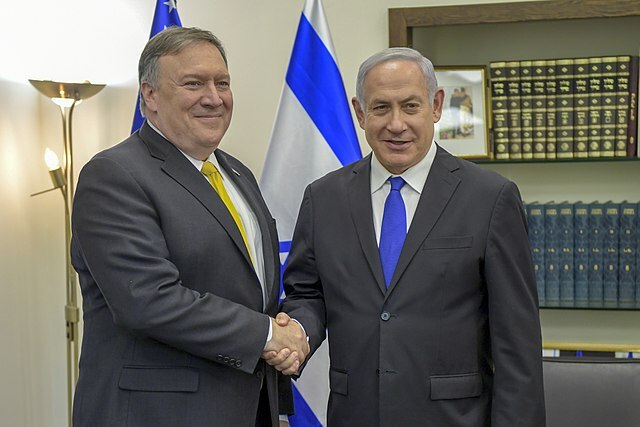 In further talks with Israeli President Reuven Rivlin [on Thursday], Pompeo added that he believes the US has a "moral obligation" to ensure the security of Israel, and that the US acts "on a daily basis" on Israel's behalf. After 52 years it is time for the United States to fully recognize Israel�s Sovereignty over the Golan Heights, which is of critical strategic and security importance to the State of Israel and Regional Stability! Under Trump, Israel has achieved almost every goal it aimed for: the scrapping of the Iran deal, the recognition of Jerusalem as Israel's capital, moving the U.S. embassy to Jerusalem, a surge in settlements, and an intensification of the abuse of the Palestinians. Every form of U.S. aid to Palestinians in the West Bank has ended. We're now the only country to have no diplomatic relations with the Palestinians, and just defunded the U.N. agencies that serve Palestinian refugees. Again you might ask: What did the U.S. get in return for all this from Israel? And again the answer is: Nothing.